NPWT is increasingly used in patients with diabetic foot. The protocol for performing NPWT is subject to debate. Main concerns regard the type of suction to use (continuous, intermittent, or variable), the wound-packing material, or the exact pressure to apply. Typically, an optimum pressure range of –80 to –125 mmHg is indicated. 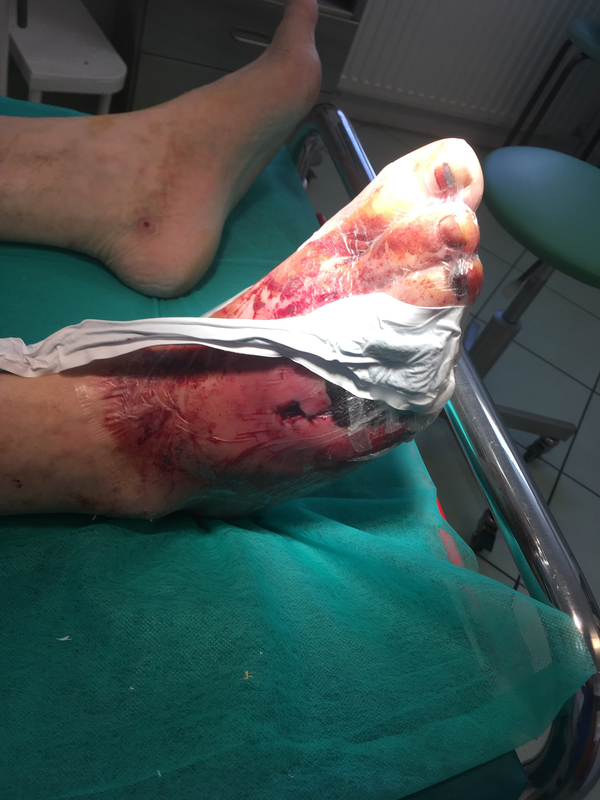 Following bone resection in diabetic foot patients, the surgical wound is left open, which often entails bleeding from the resection site. In these cases, the start of NPWT was typically delayed by 24–48 hours – during that time a pressure dressing was applied – and NPWT was only started once bleeding had ceased. In order to initiate NPWT as soon as possible, we decided to start it at a higher negative pressure than usual, i.e. –180 mmHg, expecting that this would stop the bleeding. Only then would we reduce the negative pressure. This paper presents the course of NPWT with high negative pressure values after an amputation in 2 diabetic foot patients. In both cases, our assumptions were confirmed. The patients did not bleed, the drained volume did not exceed 30 ml (which seems clinically insignificant) in the first 40 minutes of treatment. Later, with negative pressure at –120 mmHg, no bleeding into the dressing was observed. Following the treatment (which lasted for 9 days), the wounds granulated normally, with no signs of inflammation. Applying VAC dressing using high negative pressure values to bleeding wounds immediately after surgery may stop the bleeding, enabling immediate initiation of NPWT.